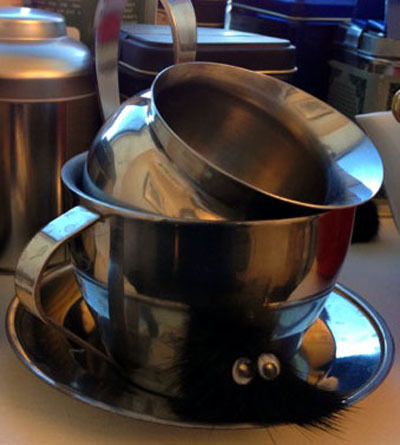 The estimable xJane sent me a splendid idea for making an army of teeny googly-eyed minions, and she has kindly allowed me to share her technique. The only sticking point is that I can’t point you to an online source for the type of trim she mentions because I’m completely stumped as to what it’s formally called. I searched for half an hour for things like “fur fringe” and “fabric trim fur tufts” and the closest I got was fur braid which I’m not dead sure is the same stuff. So check your local craft/fabric stores and if you know of an online source let us know in the comments. 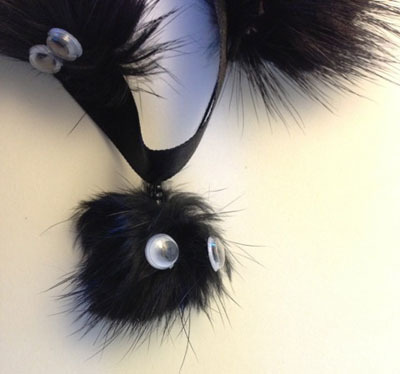 So you take one of these things, which is a trim that you can get at most fabric stores with little fur tufts connected to a ribbon by beads that they expect you to, I don’t know, put around your lamp or something? And add googly eyes to it!! Leaving me with a saucer of tiny friends (the best kind—also they don’t talk, which is a plus—but they’re great listeners). And then I place them strategically around my office. I can’t decide if these are theft protection for my teas or a slightly crazy companion for tea time. Hello, cheap and easy way to create many tiny, silly friends. Hide them everywhere. Tuck them in coat pockets when nobody’s looking. Perch them on keyboards and let them gaze sternly at cubicle interlopers. Drop one in your kid’s lunchbox and leave them along with the tip at restaurants. Everybody needs a lurking minion or two, and this is a marvelous way to make people’s day a little more surreal. Brilliant. What exact year did “making love” stop meaning “wooing someone” & start meaning “doin it”? I bet there were some hilarious mixups that year! My kids have been so awful today I keep expecting the Oompa Loompas to appear and sing songs about them. I dress like a time traveler in a romantic comedy trying to figure out what people wear. Live your life like if those Pac-Man ghosts were chasing you. Watching Gremlins. Obey the rules FFS! If I was in this film, it would just be 90 mins of a safe dry Mogwai in lots of different outfits. Learning what it means to be a man. Got woken in the night by our daughters music box slowly playing a lullaby and was only medium terrified. It’s time for a bunch of shoe-related stuff that’s too disjointed for individual posts. Whee! BoingBoing recently had a couple of posts featuring shoes decorated with false teeth: Apex Predator (first comment: “Wait til you see the tongues”) and Toothy Ladies Shoes. These could be DIY’d without too much trouble, and the false human teeth could be replaced with animal teeth used for taxidermy (on the women’s version at least; pointy teeth probably wouldn’t work so well on the soles of shoes). Some retailers of interest include Hades Footwear (their site is unfortunately coy about wear to buy their products, although Steamtropolis carries a selection), Gentleman’s Emporium (both Men’s and Women’s styles, plus a whole subsection of Steampunk), Demonia, Iron Fist, and Sinister Soles (in particular I like these and these). Also not exactly goth, but Julian Hakes’ Mojito shoes are awesomely weird. I can’t decide if they look comfortable or not. His channel is here, plus he also has a horror series called Camera Obscura, available here. a long long adventure with hobbit – Gorgeous Celtic-style artwork depicting Bilbo Baggins’ entire adventure. This would be a stunning embroidery project. The Charles Addams Mother Goose – Addams did the illustrations for an edition of nursery rhymes in the 60s. There are some sample pages here. NMBC Cake Pops – The Mayor is a little complicated, but the Jack Skellington ones look pretty easy to DIY. Vampire Bat Weathervane – They look more like pipistrelle bats to me, but the vane is still pretty. Top 10 Indie Horror Games of 2012 – Roundup of intriguing horror games. There are even a couple of free ones on the list. Over at Eclectic Wonderland, Marisa showcases some splendid Doctor Who-themed sneakers that she embroidered to wear to a convention. She comments elsewhere that they were too time-consuming to make for sale, so these aren’t something you could knock out in an afternoon, but if you’ve got some time the required skillset is fairly minimal. The embroidery is all very simple outline stitch, and none of the images have any fiddly detail bits, the easier to stitch onto an uneven surface. You’d want to choose shoes made of thin material with no extraneous decoration, such as simple canvas sneakers (slip-ons rather than laced would make this even easier). Marisa chose iconic images from the series, but obviously darker material could be used: Either images from your own favorite TV series/movie or simply random spooky elements like blood droplets, vampire fangs, and bats. Hand-draw (or, if you’re truly hopeless with drawing, find clip art with very simple lines) your chosen images, then using transfer paper (available at sewing supply stores) to copy them onto the shoes. If you really mess up, the transfer lines can be removed by dabbing them with a wet cloth and a drop of dish soap. When stitching, be careful not to leave big knots on the inside which might irritate your feet. This is a nicely portable project, so it’d be a good project for long car rides or just sitting in front of the TV. Now here’s a cause we can get behind: 600 Monsters Strong is an organization whose stated goal is “Bringing friendly handcrafted monsters to children in need worldwide.” It was formed in the wake of the Sandy Hook shootings, and they focus on kids whose lives have been marred by gun violence. They create their monsters from “approved” patterns on Ravelry (I guess to prevent confusion over what an appropriately friendly monster might look like), and ship them off to kids in need. Some of the group’s completed monsters can be seen on their Instagram page. Those are some mighty huggable monsters. Giving away monsters to needy kids sounds like a worthy goal to me. If you don’t want to get involved with the group at large, a local children’s hospital or homeless shelter would be very grateful for such a gift. Yes, yes; “Gangnam Style” parodies are tres overdone. Just hush and enjoy the outfits. Artist Vladimir Stankovic creates all sorts of surreal drawings, many of which seem to involve either insects or sea life. In his Cephalopodoptera series he combines the two, positing species which represent the missing link between molluscs and insects. Several of them are subtly animated to depict bioluminescence. They’re laid out like vintage biology illustrations, with diagram numbers, species names and labeled parts. The drawings are all wonderfully serene, with lots of furry antennae and lazily-twining tentacles. I’m honestly disappointed that I can’t own an aquarium full of these happy little beasts. Be sure to check out the rest of his portfolio on Behance (which also includes links to his stuff on deviantART and elsewhere) for more neat illustrations. Tentacle Charm – DIY tentacle made of polymer clay. London Street – Drawing by deviantART user nkabuto. This is just all kinds of atmospheric. Scooby Doo Surveillance Cam – How to make one of those “eyes are following you” portraits without having a secret passage behind your wall. I Am Who They Were – Really interesting necklace composed of photos of the artist’s ancestors. Geeky Save-the-Dates – Cute ideas that could also be adapted as party invitations. Trilobite Glassworks – Etsy shop specializing in fused-glass insects and other oddities. Cruel Intentions Studded Bra – Falls squarely into the, “Impractical but will certainly get you noticed” category. 999 Haunts – An illustrator with entirely too much time on his hands has drawn all of the alleged 999 ghosts in Disney’s Haunted Mansion. Prints are available. 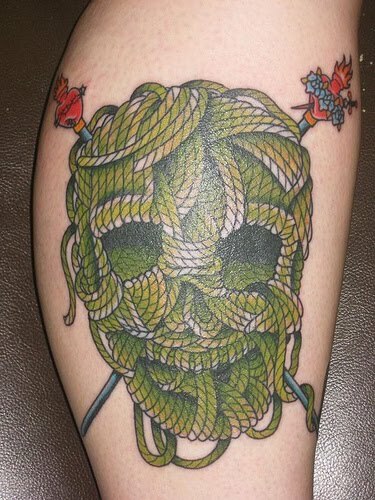 Yarn Tattoo – This may be my favorite “extreme knitting” tattoo ever.